3 November 2015. A medical and engineering team developed a technique for three-dimensional printing of blood vessels that deliver oxygen and nutrients quickly to regenerated tissue. Researchers from Rice University in Houston and University of Pennsylvania in Philadelphia published a description of their work in a recent issue of the journal Tissue Engineering Part C: Methods (paid subscription required). A team of bioengineers from the lab of Jordan Miller at Rice and surgeons led by Pavan Atluri at Penn’s medical school devised the 3-D printing technique to address a weakness in regenerative medicine, slow growth of blood vessels in the body to support engineered tissue or organ implants. That natural growth process can take days for blood vessels to grow from nearby tissue around implanted scaffolds, which can starve cells inside the live engineered tissue before they connect to the circulatory system. In earlier work, Miller and colleagues at Penn and MIT designed a process for 3-D printing of sugar into temporary glass-like biocompatible filaments lined with cells from blood vessels through which pumped blood could flow. In lab tests, the filaments provided immediate oxygen and nutrients to liver cells from lab animals in engineered tissue samples, with the sugar filaments later dissolving. In the new study, the Rice team used 3-D printing to create a network of sugar filaments for blood vessels into a mold with silicone gel. Silicone is a flexible polymer approved for breast and other implants. After the silicone gel hardens, the sugar filaments dissolves leaving tiny channels, about 1 millimeter across, through which blood can flow. As noted by Miller, the 3-D printed components each have a required inlet and outlet, with main vessels branching into smaller vessels. 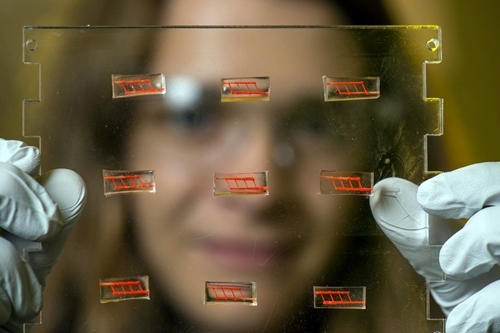 Surgeons at Penn, led by Atluri, tested the silicone blood vessel components in lab rats. The surgeons attached the silicone components to the femoral artery, the main blood vessel feeding the leg, and a graft in the hind limb of the animals. Using doppler imaging, the researchers then measured blood flow from the artery through the implanted component to the leg. The team reports the implanted blood vessel components can withstand normal pumping pressure, and remain open for up to three hours. The Rice lab uses an open-source RepRap 3-D printer. Miller is designated a core developer for RepRap printers and contributes the lab’s findings to the RepRap community.